EVERY YEAR ABOUT THIS TIME, my blood pressure temporarily spikes in response to my anger. Anger about ever-rising health insurance premiums depleting our family pocketbook faster than a pick pocket. I’ve vented and raged and spewed my discontent here. My jaw drops. My mind thinks a few unprintable words. My stress rises. How can we continue to pay these astronomical premiums and still have money for basic needs like food, gas, utilities, clothes, etc? I am thankful Randy and I paid off our mortgage decades ago, that our three kids are out of college and independent, that we’re OK driving aging (2003 and 2005) vehicles… We’ve always been, out of necessity, fiscally conservative, just as we were raised within poor rural families. Let’s break it down. Health insurance premiums for my husband and me (I’m on his work plan) will go up $190 from $873/month to $1,000/month in 2018. That’s for each of us. Randy’s employer pays half his premium, $500. So we will shell out $1,500/month, or $18,000/annually. But before insurance kicks in, we must pay $3,600 each in deductibles. Alright then. Let’s recrunch those numbers. In reality, our premiums are $1,300/month each if we need medical care and reach our deductibles. Times two, that’s $2,600/month or $31,200/year. Subtract the $6,000 Randy’s employer pays for his insurance and we’re down to $25,200. Still. This year I met my $3,700 deductible. But I paid out $14,176 in premiums and deductible for around $4,000 (maybe a bit more; some bills haven’t processed yet) in medical expenses. I’m no math whiz. But even I can see that makes zero financial sense. Somehow we’ve managed on a modest income, Randy’s as an automotive machinist and mine as a self-employed photographer and writer. But these latest insurance premium hikes are pushing us to a financial breaking point. I need to figure out an alternative to the $1,500 to be deducted from Randy’s paychecks each month for health insurance in 2018. Our incomes are not increasing to meet this through-the-roof expense. Go without health insurance. Not a good idea given our ages and the financial risk. Find jobs with better benefits. At age 61, that’s unlikely. Take on second part-time jobs. Use a Christian-based health cost sharing plan. A strong possibility that requires additional investigation. Our eldest daughter suggested we move to Canada with its publicly-financed healthcare. I know little about that system. But in a recent conversation with a Canadian visiting her brother here in Minnesota, I heard all about the shortage of doctors and the months of waiting to see one. Even if you’re seriously ill. No, thank you. Besides, I won’t move that far from my granddaughter. There you go. Now, on to the research, the discussions, the continuing frustration and anger and stress and number crunching that each autumn overtake me. I’ve joked with Randy that soon he’ll pay his employer to work because nothing will remain of his paychecks. I wish that statement didn’t feel uncomfortably close to reality. AS BAD AS THE RATE HIKES would be for us, I know it could be worse. I’ve seen rates from a major carrier for individual off-exchange health insurance in my county of Rice and seven other southern Minnesota counties. If I chose the bronze plan (least expensive) with a $6,650 deductible, my monthly premium would be $1,361. Take that premium and deductible times two (there would be no subsidy from Randy’s employer) and our health coverage would cost $45,964 before medical bills would be covered. Holy cow. Who can afford that? Not us. I realize many of you, especially self-employed small business owners or employees of small businesses, are dealing with the same absurd health insurance premiums. I don’t have an answer. I just know that the escalating cost of health insurance is creating a personal financial crisis for many of us. Additionally, because of those costs and matching high deductibles, we can’t afford medical care. Now does that make sense? TELL ME: Are you dealing with/facing similar skyrocketing health insurance premiums? I’d like to hear about your situation and what you are doing. Are you going without insurance? Selected another option? Found a job with better benefits? Whatever you have done, or haven’t, I’m listening. Please note that I moderate all comments. So please keep the discussion on topic and civil. I EXPECTED THE INCREASE. Yet, when I received notice of a $190 monthly hike in my health insurance premium, I reacted with shock. And anger. My new premium for an individual policy with a $6,550 deductible will be $602. Are you BLEEPING kidding me? That’s a 46 percent increase from my current $412/month premium. Plus, the deductible jumped $1,350 (from $5,200). For a “bronze” policy that basically offers only catastrophic coverage. I decided to let the news simmer. Maybe time would ease the sticker shock, the worry about extracting more money from an already tight budget. Perhaps I would accept this as simply the way things are under the Affordable Care Act. That hasn’t happened. I’m still mad. There’s nothing affordable about my health insurance premium. But anger doesn’t solve problems. I needed to make a decision and stop thinking that I could just as well drive down the highway and toss $7,224 out the window toward the offices of a company that advises me in its ad campaigns to Live Fearless with a Trusted Name. Really? 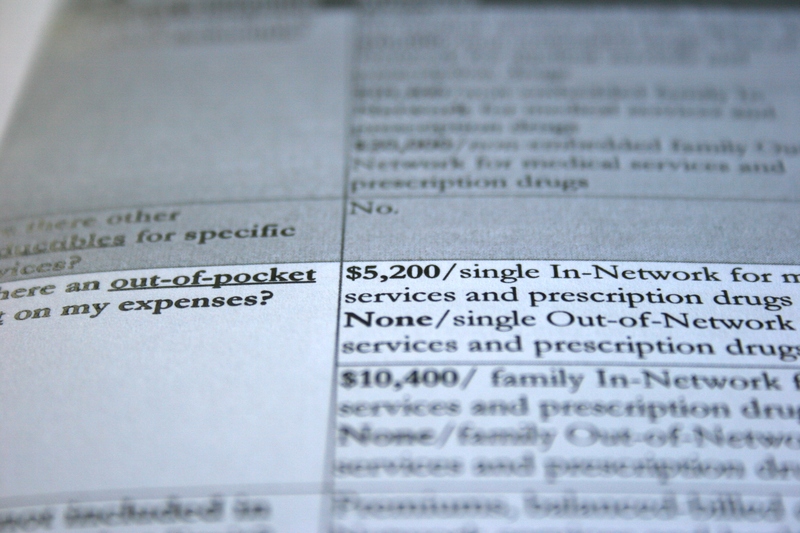 The cost of health insurance is now my biggest financial fear. The health insurance issue wasn’t going away. So I scheduled an appointment with our accountant (who also sells insurance for the aforementioned company) to discuss options. She is as upset as my husband and me about the escalating cost of health insurance. In three columns on lined paper, she inked in the existing options—stick with my individual plan or choose one of two plans offered through my husband’s employer. We inquired about other plans, too, and I later followed up by visiting the MNsure website to compare plans. Since my husband’s employer offers health insurance, we can’t get a subsidy anyway and it would be minimal if we could. 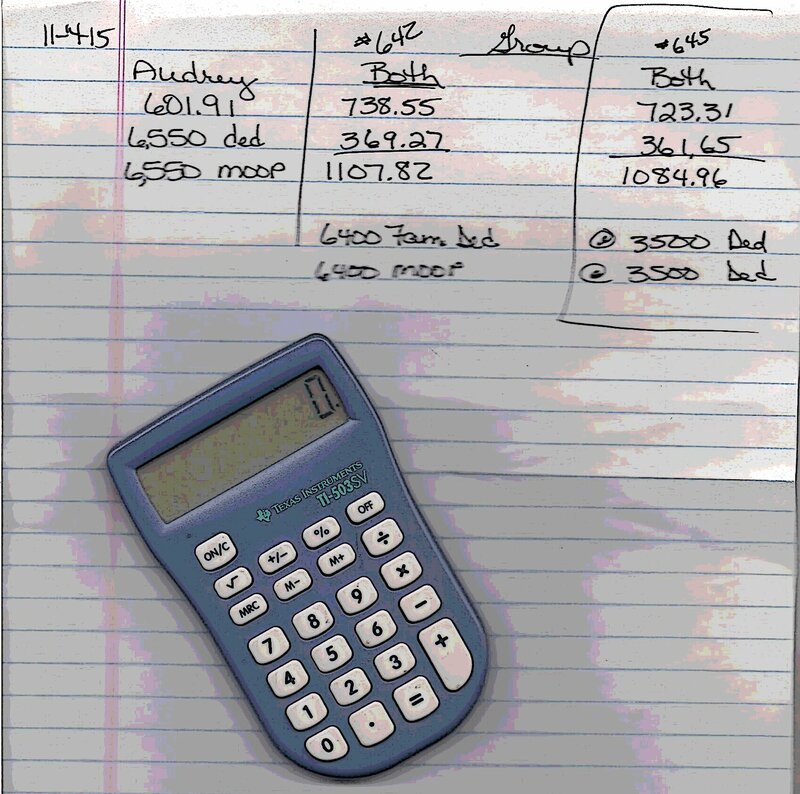 We settled on a $3,500/person deductible company plan with a $723/person monthly premium. (With the Live Fearless company.) It made the most sense given the premium and deductible differences and the impact on our taxes (which is why we saw the accountant). My husband’s employer pays half of his premium. That $361/month will help. I will now pay $723/month rather than $412/month. My health insurance in 2016 will cost me $8,676 compared to $4,944 currently. Add in another $204/month for our college son’s health insurance premium and our family will fork out $1,288/month for health insurance premiums in 2016. (Keep in mind that the employer will add $4,332 to the pot, pushing the total annual premium cost to $19,788) Affordable? No. But I suppose one could argue that, if we need to use our health insurance beyond our $3,500 deductibles (for my husband and me) and rack up substantial medical bills, we will consider the $15,456 we paid in 2016 premiums well spent. Health insurance, for us and I suspect many, has become basically a catastrophic plan that keeps us from going to the doctor. Thankfully, our home mortgage was paid off years ago. We have income. Both of us grew up in poor families, therefore are thrifty. Yet, at this stage in our lives nearing retirement, we shouldn’t have to worry about out-of-control, astronomical health insurance premiums. Something has to give here. With so much of our income now going toward health insurance, we are not spending elsewhere. Or saving for retirement. Like our tightening family budget, the economy will feel the impact. GO AHEAD, VENT. Tell me your health insurance woes. Solutions are welcome. I know my family is far from alone in facing these excessive health insurance costs. Click here to read a related story published on MPR. FOR A FLEETING MOMENT I thought I’d made an error. You know that moment—when you think your luck has shifted and your day is about to become very good. That happened last Friday when I received a letter from the Rice County Auditor-Treasurer’s office. Inside I found my check for payment of my second half property taxes. The check was being returned, the correspondence noted, because all taxes were already paid. What? Had I made an error? I checked my records. No, no mistake. For a moment I considered that perhaps an anonymous philanthropist had paid my taxes. Within the hour, I was at the Auditor-Treasurer’s office inquiring. Computer problems, the employee explained, resulted in the erroneous check return. 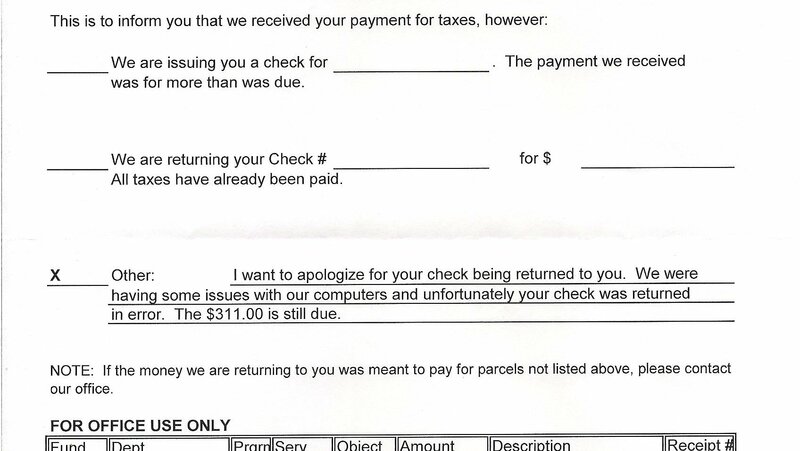 I still owed $311 and could expect a follow-up letter. A snippet of the letter I received with identifying info cropped. How many other Rice County property owners received the first letter and momentarily celebrated? Legally, would a property owner need to pay his/her taxes if he/she received a “paid in full” notice like I got? Why wasn’t the error caught before the initial letter was mailed? Are “issues with our computers” truly “issues with our computers?” Or can issues be traced to a human? And, yes, I got a receipt from the county employee after my office visit. Proof that I’d paid my taxes. In full. If you haven’t yet paid your property taxes and live in Minnesota, your second half payment is due today, October 15. Unless, of course, a mysterious benefactor has secretly paid on your behalf. I PROBABLY SHOULDN’T be penning this post because it’s likely to raise my blood pressure. And that’s not a good thing considering I want to avoid activity that would necessitate a doctor’s visit. Don’t get me wrong. I am thankful for doctors and nurses and other medical professionals who possess the skills and talent to help heal people. But I’m frustrated about the ever-rising cost of health insurance. Last year my family forked out $11,022 to cover three of us—two late fifty-somethings and a 20-year-old. Do your math. That’s just shy of $919/month. Add on the $4,048 we paid out-of-pocket for medical expenses in 2014 and that’s a significant chunk of money going toward healthcare costs. Info from my current health insurance documents. The monthly premium on my individual plan this year has dropped $30 to $412/month. Now you might think that a good thing. But, in order to keep my premium down, I switched insurance companies and now have a much higher deductible—$5,200 instead of $2,000. When I was considering my options in November, after my then insurer informed me that my 2015 monthly rate would skyrocket from $441 to $777, I felt like I was gambling. I am. I’m gambling on not needing to visit a doctor, except for “free” preventative care, in 2015. Minnesota Public Radio nailed it in a February 10 headline, High deductibles keep patients away from care. (Click here to read that story.) Yes, as crazy as it sounds, many of us now carry deductibles so high that we think twice about going to the doctor. What good is health insurance then? I consider my health insurance coverage a catastrophic plan. I need the coverage “just in case” something major happens. These ever-rising costs need to be brought under control. The current system isn’t working for lower middle income families like mine and, I expect, most families except those fortunate enough to have full employer paid health insurance. Employers are feeling the financial burden, too. I’d guess some small business owners have had to reduce benefits or even lay off employees. One positive note with healthcare reform, though, is the elimination of the pre-existing condition clause that prevented me from switching insurers. Every fiction writer knows that beneath the surface always lies some bit of truth. “I married the wrong girl!” made me laugh out loud in an “I wish this wasn’t true” sort of way. But, as they say, laughter is the best medicine. And that doesn’t cost us anything. FYI: Today marks the final day to open enroll through MNsure, in other words the last day you can purchase health insurance through this venue until the next open enroll later this year.